Travelmyth is the hotel recommendation engine for sophisticated travellers seeking unique holiday experiences. With 45 unique categories, you can choose and combine any category to find your perfect accommodation. We answer advanced hotel search queries based on your interests and recommend the best hotels. Then we compare prices from the biggest booking sites to find the best deal for each hotel. It's up to you then to book on our booking partners or book on Travelmyth. We currently have 1,714,762 hotels in 45 categories. Why another hotel search engine? Hotel searches in specific categories are poorly answered or not answered at all by our competitors. First, we have built proprietary technology (sophisticated algorithms and AI machine learning models) and we collect information not available anywhere else online allowing us to respond to long tail search queries even in the most unique categories. Proprietary technology helps our editors handpick tens of thousands of hotels with immediate proximity to a beach. Beachfront hotels may be separated from the beach by a road, but not by other buildings in between. For hundreds of beachfront hotels, we have collected specific data regarding accessibility, type of beach, cost of umbrellas and watersports, presence of a lifeguard and many other details not available anywhere else. 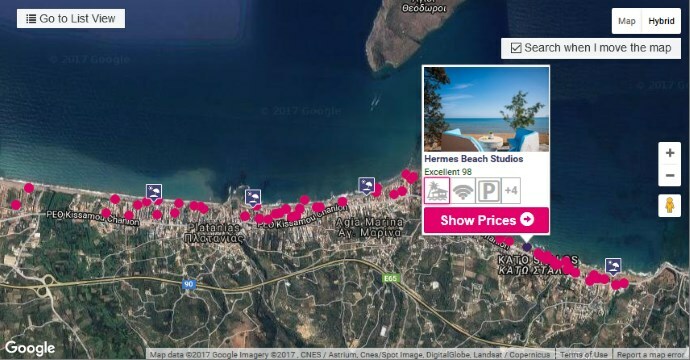 Try the map view, so that you can easily check the hotel and the beach. We’ve asked hoteliers more questions than the most demanding travellers with pets would ask. We know costs, leash rules, waste disposal requirements and any accessory that is provided by the hotel. We even know if dogs are allowed on beds. Based on the responses, we rank the dog friendliness of each hotel. For example, a hotel without extra fees and with leash-free play areas will rank higher than a hotel with extra fees and a kennel requirement. This is how Travelmyth recommends the best dog friendly hotels. Among the 47 hotel categories that we describe, some are unique. Have you ever dreamed about swimming in an infinity pool? How about staying in a monastery or castle converted into a hotel? What about a hotel where children are prohibited? Or a hotel with a vineyard or with over-water bungalows. How about an eco-friendly hotel? Or even a haunted hotel? What about a brand-new or a skyscraper hotel? Second, it’s not necessary to name your destination when starting a hotel search. Travelmyth introduces a new way to shop for hotels if you are not sure where to go. Instead of asking you to name your destination - like most other hotel search engines do - we only ask you to select a preference from a list of hotel categories. Then we recommend the best hotels based on your ratings and explain why they are the best choices. We emphasize "best" as we want to present you with the top choices – not necessarily the cheapest deals. There are plenty of other travel search engines out there if youare looking for just the cheapest rate. Of course, after recommending the best hotels, we compare prices from several booking sites to make sure that you book the best hotel at the best available rate. Before Travelmyth, it was extremely difficult to find the best hotel based on what you really liked. Have you ever tried to search for the best beachfront hotel that is also pet-friendly and has a golf course? What about staying at a former castle that has its own vineyard? By allowing complex searches and maintaining hotel collections that aren't available on any other search engine, Travelmyth helps you discover hotels that you really like but would never have discovered. Why another online reservations platform? Through our contracts with hotel wholesalers and our proprietary technology we're able to offer competitive prices at tens of thousands of hotels. After collecting and analyzing massive amounts of data for hundreds of thousands of destinations, hotels and landmarks around the world, we rank the hotels using a proprietary algorithm. We then return the most relevant results according to your query and present them in a comprehensive way. Our mission is to provide you with the best personalized travel recommendations possible - just like the travel agent who listened to you and helped plan memorable holidays before online booking. Now we have advanced algorithmic technology allowing us to supply results for more complex searches than the most intelligent travel agent could even dream of handling. Thank you for trying Travelmyth. We‘d love to hear your feedback! Visit our press page to find examples of media coverage, interviews and presentations, our news, media assets and contacts for media inquiries.